Leveraging our expertise, Libraries Without Borders will provide immigrants in the Washington, DC area with certified legal resources to help them understand their rights and make informed decisions about their lives. Unfortunately, many immigrants in the DC area — and across the US — lack basic legal knowledge, which renders them vulnerable to misinformation and predatory practices, such as notarios. Those who are aware of their rights often struggle to navigate the dizzying array of resources available on and offline. They may lack the digital skills to search for this information, not know what laws or regulations to look up, or fail to recognize their eligibility for relief. Due to the complicated nature of immigration law and the frequency with which it changes, Libraries Without Borders has solicited legal experts from across the US to serve on our inaugural legal advisory board. This board will periodically review the content selected for each site to verify its accuracy, ensure it aligns with the needs of DC’s immigrant community, and certify it reflects current federal immigration policies. The inaugural advisory board members are listed below. 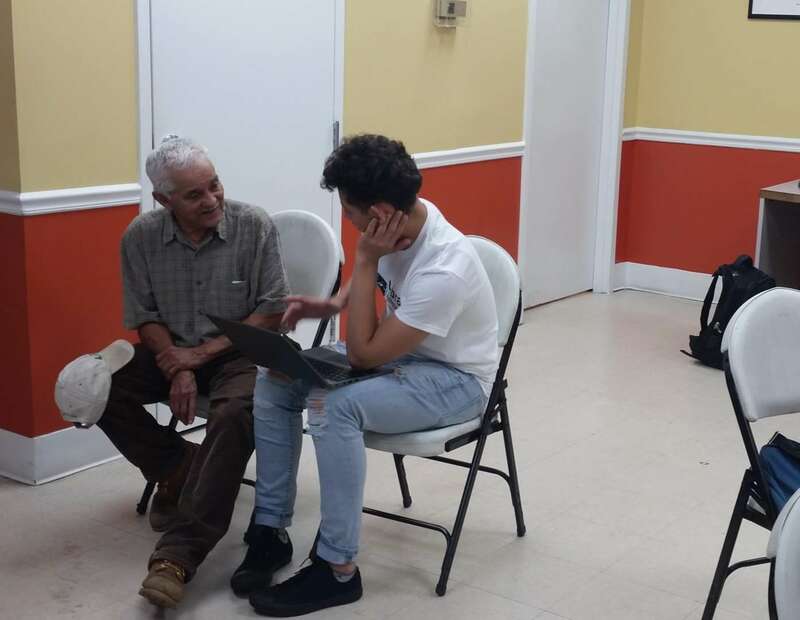 One of the student facilitators from the International Academy helps a patron at the CASA de Maryland Welcome Center navigate legal resources on our digital library.